This summer has been one of my craziest yet. An avalanche of work started in June and is finally subsiding now, at the end of September. And even though I'm still "booked out" with my agency, they keep sending me out. I have an audition for a commercial on Monday and had one last Friday for an IBM print job. I ran into Bruce Locke at the print audition and we had coffee and walked around the neighborhood. He wanted to know what was new and good in my life and I told him I think I may be getting married next year. Bruce has known me since I moved to L.A. 15 years ago, and he says he's envious of the way I've matured. We talked about wanting to marry this or that girl, but somehow it just didn't work out, and why didn't I go out with so-and-so while I had the chance. Regrets, and learning not to have any. I think that's the key. Albert, a young kid with dreams big enough to fill a baseball field, went up to bat and hit the first one — a low and outside pitch hardly meant to be more than a warm-up to feel out the batter — into a deep gap between center and left field. He ran the bases better than anyone he knew, or who knew him, and by the time the ball was retrieved and thrown to the catcher at home plate, the boy had already ran the bases, hit a round of high-fives, taken off his baseball cap, drank a mouthful of rusty water, spit it out and proceeded to sit down on the old bench with the various marks etched in and rubbed over from all the years. After the game, he talked to the old timers who came around to catch a look at the young’ns coming in — the next generation of major league dreamers. It was a wonder to watch the cycle of baseball players go through the seasons year after year. The old ones retiring, getting their Hall of Fame placards, the new ones entering little league and the All-Staters who led their high school team to first in the double or triple A league of their local school district. Autumn, winter, spring, summer. For some, it was a mesmerizing act of nature to witness. For Joe “The Leaf” Withers, it was fast becoming an act to lament, for he was at the only part of the season where man and nature don’t agree with: the end of summer. Joe was trying to be careful with the kid, but depending on his mood and how his body was aching that day, that line of care was drawn with a gray marker from day to day. Joe had been volunteering for the local little league since he was a major league second baseman. He was never an All-Star, never even made the ballot, but he had a decent head on his shoulders and thought volunteering was the right thing to do. It also got his mind off things once the divorce finally settled in, his ex taking the house, the cars, the kids and the dog that he named Scruffy after finding him dirty and alone and abandoned on the streets one afternoon. Now that Joe was being trained at both third and first in the farm league, he was starting to think that “School ain’t so bad, kid. It’s when the brain stops wanting to learn when you got to start worrying.” Truth is, he had stopped wanting to learn — a long time ago. Albert, at five-three, looked up to the six-two Joe in more ways than one. In baseball, just getting to the major leagues is the big time. Being a star, well, that’s up to the god of all baseball gods. Albert knew this, even at 13 years of age. He was a solid young man with solid young dreams — no lofty ideas that went to the point of having to experience a miracle. “Joe, what’s it like to be in the majors? You think I got a chance?” asked the kid. Joe looked at him with his weary, tired eyes. He knew there were scouts on that baseball field, scouts from high schools, scouts from farm leagues, even on occasion a scout from another country, taking notes on anyone with potential. He knew the struggle of having to maintain a certain level of academics when all you could think of was playing baseball and getting into the right school with the right coach with the right team and right teammates, none that outshone you, but ones that fit right in with your game. He knew about kissing up and also not kissing up, when the timing was right. Sometimes playing the guy “who don’t want no help” can be a disguise for getting attention by a coach looking to break down a wild horse and build him back up. He knew how many cities you eventually forgot how to appreciate — after playing a hundred and fifty or so games a year all across the country. If you liked to travel, it was because you had a girlfriend waiting for you in every city, and they didn’t care a thing about who was waiting for you in the next city. He knew about the workouts and skipping the workouts, because in baseball, as long as you can hit the ball and run after one in the field, as long as your eyesight wasn’t going away, as long as your mind wasn’t taking your vision off the ball, you were okay, and working out wasn’t the most important thing in the world. From time to time, some player would talk about this new herbal remedy you can’t get in stores — “at least outside a Chinatown” — that would give you extra energy and speed and power, just after one dose. He knew that sometimes it wasn’t the remedy that did it but the idea that the remedy could do it. Anything could help. But thinking anything could help was even better. But it was already too late, for Joe anyway. His attitude had gone sour, his game had become less than average, even his posture had begun to look like a bunch of yesterdays all rolled into one. Trying to get back what was once good wasn’t such a bad thing. It’s when you know the best is all behind you and the worst is yet to come — that’s when the posture starts to bend, and Joe “The Leaf” Withers was starting to bend. Joe had been given another chance, at least to make things right with the kid. Joe thought about something he never quite realized before: a kid’s optimism can go a long way. It was probably why he kept volunteering with the little leagues all through the years. “You know what?” said Joe. Albert beamed brightly and it lit up the shadows from the late afternoon sun. The weather was still warm but the days were getting shorter already. It was something you didn’t need a watch or a calendar for. You could just feel it, happening right before you, right before your eyes, in the still air of a baseball stadium, on the worn wooden benches where the kids sat waiting for their turn, in the dirt covering home plate. The saddest time of year. My friend, Emily Liu, will be on the season premiere of "Boston Legal" tonight as the character Alexa Chin. It starts at 9:30 pm on ABC, just after "Dancing With the Stars." I usually get more of these PR emails from actor friends but this year seems a little slow. I recently had dinner with Bruce Locke of Robocop and the TV show version of "Mortal Kombat" and he said this has been one of his slowest years. He usually plays in a lot of celebrity golf tournaments across the country. Although he's still invited to play, he has been declining lately since he doesn't have anything new to promote. "I'm getting tired of saying I haven't done anything in a while," he said. I asked Bruce if he had read for the new movie version of Mortal Kombat that's been in the casting phase. (Yes, folks, another Mortal Kombat movie.) He said he hadn't. It turns out that Chin Han had read for the same role Bruce had in the TV version many years ago. Chin Han said he was bummed about not getting the role back then. But when he got an appointment to audition for the new movie from his manager, he was reluctant to go. I actually had to convince him he was in a privileged position and should be more appreciative of the opportunities he's being given right now. He changed his mind and ended up having a great meeting with the casting folks. Recently, he had an appointment for a TV pilot and the meeting didn't go so well. But this time, I pointed out to him that a TV pilot casting is about as privileged as a cattle call, except for a slightly better grade of cattle. Again, this gave him much-appreciated perspective. Oh, I'd better jump in the shower now. My call time is in a couple hours for the Safeway commercial. Better get primping. I have a wardrobe fitting tomorrow for that commercial I'm to do next week. Already cleared it with the supervisor, too. Since I'll be in the Venice Beach area with the whole afternoon free afterward, I could probably head to the beach and soak up some end-of-summer rays and watch the waves come in. But nah, I kind of have something better to do. I sort of mentioned something about Lady Luck in another post and, well, at the time, I was being more hopeful than anything. There was, in fact, a lady, but she wasn't yet mine, so maybe I was jumping the gun. This lady has been, since the day I met her, my lucky charm, and so I wasn't exactly reaching for things. But yeah, she wasn't quite mine yet. For an entire month, I'd been courting her — nay, begging her — to be with me. She almost held out for another week, but she really felt sorry for me or something because she finally gave in. As much as I'm looking forward to the wardrobe fitting tomorrow, I'm really more excited to see her than anything. Yeah, I haven't been very forthcoming about matters of the heart in this blog, but I think my heart hasn't been very willing either. Sometime during the summer, I felt my heart just completely open up. And I have to say that it made a difference in everything, from the callbacks I got to the decisions I've made to the woman who's come back into my life. And yeah, she'd been there before, but I was just too stupid and closed-hearted to appreciate it back then. Last night, I went to a DVD launch screening for a movie I did 3 years ago called Only the Brave. 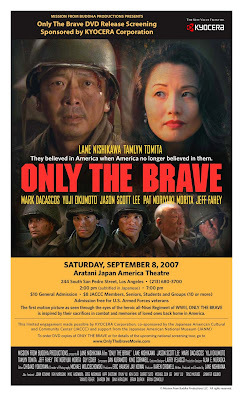 Set during World War II, it's about an all-Japanese regiment that fought for America and became the most decorated battalion in U.S. military history, mostly because about 900 of them got wiped out trying to save 200 Texans who were trapped on a mountain. I played one of these soldiers in the movie. Didn't have any lines, but it was a SAG role and I got to do a few stunts involving falls and squib shots. Yesterday, I saw that they used the fall where I actually landed pretty hard on a cobblestoned road and hit my head and bruised my arse. I felt the pain all over again when I saw the scene. Chin Han came along and I introduced him to a few actor friends, including Garret Wang, Amy Hill, and some folks from my old improv workshop, Cold Tofu. It's funny because none of these actors know who Chin Han is right now, and I never mentioned what project he's on either, but they'll figure it out soon enough. Asian actors always make it their business to find out what other Asian actors are doing. Hanging out with Chin Han, I didn't think to let anyone know about my recent bit of luck in booking the commercial. It just seemed like small potatoes in the grander scheme of things, even though to me it's rather significant. But being in the movie, even with no lines, seemed to give me a bit of credibility last night. A few friendly women even asked me to sign their DVDs. One girl from my improv class was so impressed by my non-speaking part that she looked like she was about to melt. Either that or she just had to pee really bad. I happened to run into her while she was waiting in the bathroom line. Last week, it got to 111 degrees in Valencia! That's an oven on "warm." That's hotter than an Easy Bake Oven. That's enough to melt s'mores. That's one reason why you can drink a quart of water and not have to urinate all day! Well, the last one is something I experienced while hanging out in Yuma, Arizona, about 15 years ago. I was looking for a TV news reporter job and accepted an invitation to check out the job market out there. It got to about 112 that day. My host took me to 7-Eleven, bought a Super Big Gulp, and said he'll fill that up two more times that day and won't pee once. That's how hot and dry it gets in the desert. I mentioned to my supervisor that they had booked me through August, so he went and talked to his supervisor and came back and said, "Can you work at least through September? You can be as flexible as you want. Just let me know if you can't come in." That's right. They want to book me for another month, but if I have other obligations, it's okay. Alright, someone pinch me because I must be suffering from heat stroke. Or maybe the people in the office are suffering from heat stroke. I mean, this is weird. I mentioned I had some obligations at the end of September and he said that'd be fine. That's when I'll be shooting my first union commercial in, like, 3 years! Three years! Now that's a dry spell. I don't know how much a guy can earn on something like that if it airs — if I'm seen in the spot when it airs — but it's enough to make a guy pretty giddy. Just hope I don't psych myself out. That's a long time to wait. I was going through some old papers yesterday while preparing to do my taxes. Ran across a phone number from an actor named Bob Lee. I saw him at a commercial audition and we chatted and he gave me his number. I believe I gave him mine as well. Anyway, he had a pretty good run with a national commercial and I was pretty proud of the guy. He had moved from Seattle about a year before at the age of, say, 48 and he was doing pretty well for himself. About a month or two later, he went to Arizona, I believe, to visit his two sons, one of whom was performing in a play. (He'd been divorced and had visitation rights with his kids.) Apparently, he went to his hotel room one night and never woke up. It was something health-related like diabetes or asthma, but quite a shock to everyone who knew him. He seemed so happy and content just before that. It's Labor Day weekend and it's supposed to reach 95 degrees today — too hot outside to do much. I think I'll just stay home and finish these here taxes.